Drive 2 hours overland (88km) to the foothills of Mt. Kinabalu. The Mountain Garden, an excellent 5-acre specimen of entire Kinabalu Park area gives a wonderful sneak preview of the place. At the Exhibition Hall, a very informative video presentation is shown every afternoon. Evenings and early morning at the park are perfect for bird watching with over 300 species known to inhabit the area. 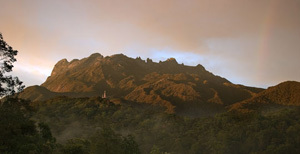 Kinabalu Park received the greatest recognition of its biological contribution when it was declared Malaysia's first World Heritage in 2000. From the cool temperatures at the Kinabalu Park, down to the warm baths at Poring, the usual swing-by for climbers seeking to rejuvenate trail-weary bodies. Poring is also for those in search of rare orchids and unusual plants such as the world's largest flower, the Rafflesia. The canopy walkway at 41m upwards brings you eye level with the treetop. 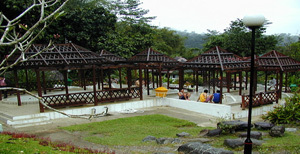 Pick up from your hotel in Kota Kinabalu and transfer to Poring Hot Springs. Upon arrival at Poring, proceed to the canopy walkway through nature trails of the lowland forest. Observe wildlife and the tropical rain forest from the canopy. You may be able to see birds & butterfly that fly below you. After lunch, depart Poring for Kinabalu National Park. Guided walk to the mountain garden to see rare collection of mountain plants and flowers. Return to Kota Kinabalu and transfer back to your hotel by 1800 hrs. Please bring: Rain Coat (during rainy season), Insect Repellent, Hat, Use Good Walking Shoes. Comfortable Cotton T-Shirt. Either Long Or Short Pant recommended.